New York, NY — December 20, 2015 … It’s not a joke. The one international organization which loves to bash the Jews and their tiny democratic state – Israel – has declared Yom Kippur, the Jewish Day of Atonement, an official holiday. Last Thursday the UN officially recognized Yom Kippur as an official holiday for the first time in its seventy year history. 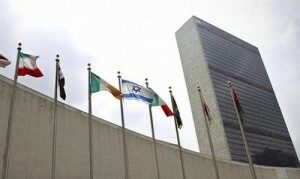 UN employees who are Jewish will have the day off and no official meetings are to take place on Yom Kippur. The UN recognizes Christmas day and Good Friday as official religious Christian holidays and Eid al- Fitr and Eid al Adha as official Muslim holidays. Efforts for the UN to recognize Yom Kippur as an official holiday began three years ago by Ron Prosor, the former Israeli ambassador to the UN. US Ambassador Samantha Power also played a crucial role in preventing the anti-Israel majority from blocking the resolution. The holiday is a day set aside to atone for sins and reflect on the year past and the year ahead. Yom Kippur lasts 26 hours, and many Jews choose to fast for the entire time. Many Jews also don’t bathe during Yom Kippur, and many abstain from cosmetics, deodorant and wearing leather shoes. No mention was made by the U.N. that the ancient Yom Kippur ceremonies took place at the Temple in Jerusalem which is the capital of Israel. A Facebook page was created for the promotion of making Yom Kippur an official holiday at the UN and in the US. Today, we ask that you join and share this page in our quest to have the Jewish New Year – Rosh HaShana designated as an official holiday in both the United Nations and in the US workplace.